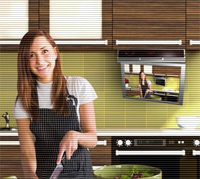 Below is our recommended list of LCD TVs for use in your kitchen. Many of the following TVs include a built in DVD player and a flip down screen for space saving purposes. If you like to watch TV while you prepare meals or just don't want to miss that Touchdown while dinner is on, this list is for you. The LD-2655VX is focused on energy efficiency, the ad campaigns for the television promote that it uses less energy than a 100 Watt light bulb. The 42" is LED edge-lit and features a 1080p, 120Hz panel. The 26" size is great for those looking for a little larger kitchen TV. All the features of the above 9 inch version but with a 7 inch screen for those of you who'd like a smaller screen. 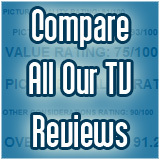 The Toshiba 15LV506 is a versatile all in one TV which allows DVD, computer input and obviously TV programming from cable or satellite. We also like the design styling of this product. Aside from their obvious aesthetic value, LCD TVs are much more practical in the home than CRT (tube-style) televisions. They take up a smaller footprint, and thus use up less floor space in the room. Also, LCD TVs are lighter and easier to move around when cleaning or redecorating. The 15LV506 is little more than three inches deep and weighs just over 13 pounds. Best of all, LCD screens use less power than CRTs and plasma screens. The unit has a 1024 x 768 pixel resolution, which puts it in the higher end of standard definition sets. Its traditional 4:3 aspect ratio makes it ideal for watching most DVD content. A built-in comb filter reduces digital artifacts produced by signal noise, making for more detailed images. The set has a built-in digital television tuner, so out of the box it can receive digital broadcast ATSC signals and QAM signals used by most digital cable providers. It also has a built-in 181-channel NTSC tuner, so it can also accept traditional analog signals. This is the same as the 15LV506 above but where the 506 has a white bezel, the 505 is black.